Of the forty-four presidents who have led the United States, nine made mistakes that permanently scarred the nation. Which nine? 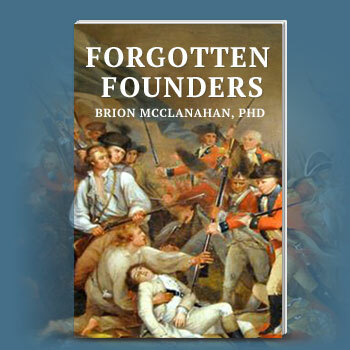 Brion McClanahan, author of The Politically Incorrect Guide to the Founding Fathers and The Founding Fathers’ Guide to the Constitution, will surprise readers with his list, which he supports with exhaustive and entertaining evidence. 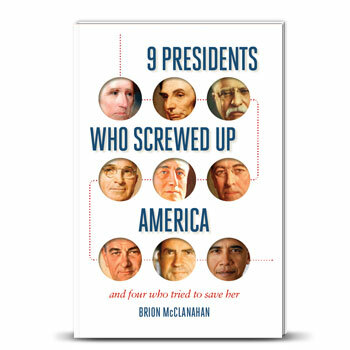 9 Presidents Who Screwed Up America is a new look back at American history that unabashedly places blame for our nation’s current problems on the backs of nine very flawed men. Available wherever books are sold, or purchase an autographed copy below. America is well on her way to becoming a banana republic. With presidents signing patently unconstitutional legislation, refusing to enforce laws they don’t like, and even making appointments without the advice and consent of the Senate, it’s clear that the federal Republic our Constitution established is hanging by a thread. And yet the chances that a president who has flouted our founding document and the very rule of law will be impeached are slim to none. Constitution that Americans can no longer claim to govern ourselves. We only get the chance to pick the man who will spend four years legislating unilaterally with his pen, waging undeclared wars, and usurping still more powers that the people and the states never delegated to the federal government in the first place.